Are you looking for something to do with your smaller bite sizes pieces of scrap fabrics? Well, let’s talk about English Paper Piecing- aka EPP. English Paper Piecing is a hand stitching technique deeply rooted in the history of sewing. The technique uses paper templates to stabilize fabric and ensure accuracy when piecing complex angles together. The shapes and templates can really be anything you can dream of, although straight lines are easier to handle. English Paper Piecing (EPP) is a traditional method of sewing that can be traced as far back as the late 1700’s in the US history books. Not only did the Pioneer Woman use this technique to create much needed bedding for the long journey ahead but they helped document the story of these times. You see, since paper was hard to come by, the woman would draw their templates on old letters, newspaper clippings and even torn catalog pages. Sometimes, the templates were left in the quilts as they were thought to provide an extra layer of insulation against the cold. Fast-forward to today and hexagons are all the rage among the modern quilting community. This little shape is making guest appearances on everything from coin purses to home décor. Let’s dive in and learn the basics. 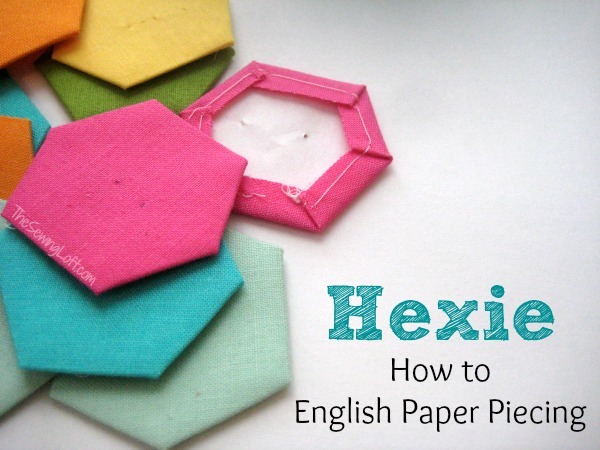 Cut your hexagon paper template to the finished size. This will serve as a sew guide and support the shape. Cut fabric 1/4” larger than paper template. This extra 1/4” is your seam allowance. Place paper template onto the wrong side of fabric. 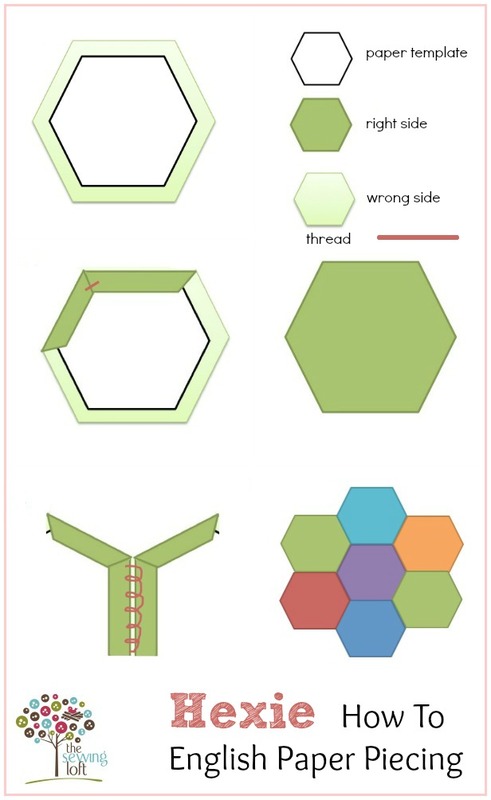 Fold over two sides of hexagon and stitch the seam allowance overlap with needle and thread. Repeat the process all around hexagon. Traditionally baste stitching is through all layers, including the paper. Join hexagons together with a simple whip stitch, working from one side to the other. Keep stitches small and close together for best outlook. Continue to stitch shapes together. After shapes are secure on all sides the foundation paper and basting stitches can be removed. These small bites of fabric can create the most beautiful patterns and fabrics when layered together. Ready to put your new sewing skill to the test? Then click here to download your free Hexie Template. Some of the most common shapes used today are the diamond, hexagon, half-hexagon, trapezoid and tumbler. Popular pattern blocks include: Baby-block, Grandmother’s Flower Garden, Star Hexagon and Diamond Star. Creating projects from smaller bite sizes pieces of fabric can be a challenge for even the most seasoned of sewers but with a little help from a small piece of paper, this process can be a breeze. English Paper Piecing is a traditional method of hand stitching that is the perfect way to create something fun from these small fabric bits. Another fun example of hexies in action is this quilt block from Quick as a Fox. If so, I’m glad you stopped by and hope that something has inspired you to keep your needle moving! Don’t miss a single project and subscribe via email HERE! Bonus- free embroidery pattern with newsletter sign up. Another great way to connect with me is via Facebook, Pinterest, Twitter , Google+ or Follow my blog with Bloglovin. I’m looking forward to getting to know you and creating together! I love hexes! They are great for working in the car, on the plane or on the couch in front of the tv. Thanks for the template! I love EPP and hexagons. I always have multiple projects going. I’m really digging them too lately. Actually, I am loving tumblers! Working on a project right now. Hoping to wrap it up and share this week.